The XT612M includes a brushless hammer driver-drill with two speed settings, a brushless impact driver with 1,500 in.lbs. 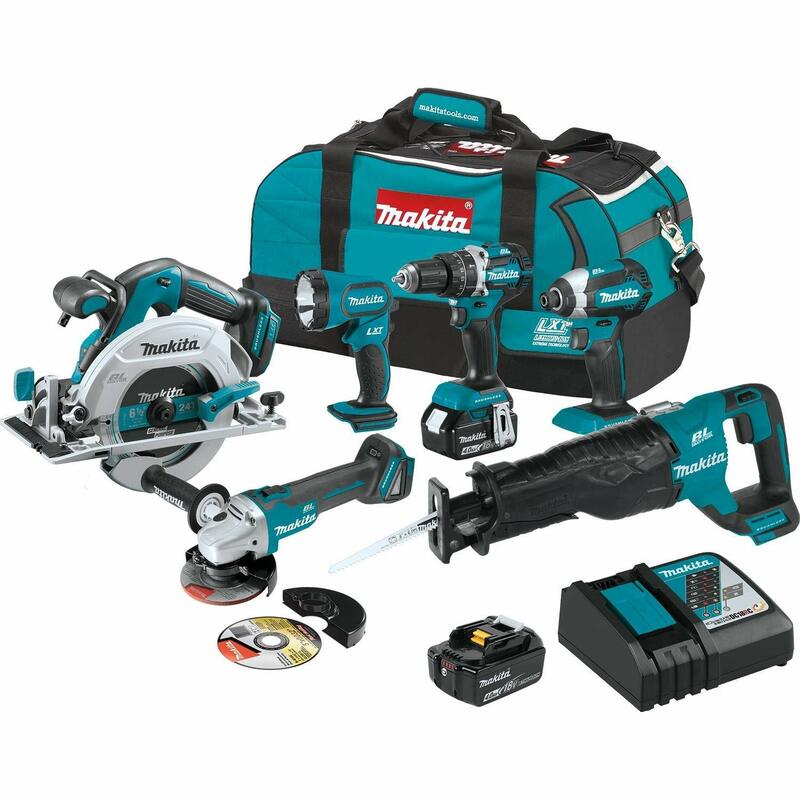 of Max Torque, a brushless 6-1/2” circular saw with a full 5,000 RPM for faster cutting, a brushless recipro saw with two speed settings and a 1-1/4” stroke length for faster cutting, and a brushless 4-1/2"/5" Cut-Off/ Angle Grinder with 8,500 RPM. The kit also includes a four-position flashlight with a single xenon bulb that provides 180 lumens. It’s a one-stop solution for a wide range of applications. The kit includes two 18V LXT® 4.0Ah batteries, and each reach a full charge in only 40 minutes on the efficient Rapid Optimum Charger – the fastest charge-time in the category – for less downtime and increased productivity. For added convenience, the batteries feature an integrated L.E.D. battery charge level indicator. Sku XT612M Brand Makita Voltage 18V Amp Hour 4.0Ah Tool Count 6 Shipping Weight 41 lbs. Chuck Size 1/2 in. Chuck Type Keyless Capacity (Steel/Wood/Masonry) 1/2 in. / 1-1/2 in. / 1/2 in. No Load Speed 0 - 500 / 0 - 2,000 Rpm Blows Poer Minute 0 - 7,500 / 0 - 30,000 Bpm Max. Torque 530 in-lbs. LengtH 7-1/8 in. Product Weight 4 lbs. Drive Size 1/4 in. Drive Type Hex No Load Speed 0 - 3,400 Rpm Impacts Per Minute 0 - 3,600 Ipm Max. Torque 1,500 in-lbs. Length 5 in. Product Weight 3.3 lbs. Length of Stroke 1-1/4 in. Max. Cutting Capacity (Wood w/ 12 in. Blade) 10 in. Max. Cutting Capacity (Pipe) 5-1/8 in. Strokes Per Minute 0 - 2,300 / 0 - 3,000 Spm Length 17-1/4 in. Prodcut Weight 8.2 lbs. Blade Diameter 6-1/2 in. Arbor 5/8 in. Max. Cutting Capacity (45-Degree) 1-5/8 in. Max. Cutting Capacity (50-Degree) 1-7/16 in. Max. Cutting Capacity (90-Degree) 2-1/4 in. No Load Speed 5,000 Rpm Length 13-3/4 in. Product Weight 7.3 lbs. Wheel Diameter 5 in. No Load Speed 8,500 Rpm Spindle thread 5/8 in. - 11 UNC Lock-On Switch Yes Lock-Off Switch No Switch Type Body Grip/Slide Length 14-1/4 in. Product Weight 5.8 lbs. Brightness 180 Lumens Run Time Up to 7.5 Hours Bulb Type Xenon Length 11-1/8 in. Product weight 2.1 lbs.